She worked with another legendary perfectionist, Arturo Toscanini, who requested her for Mimì in the fiftieth-anniversary performance of LA BOHÈME. She loved working with him and was equally delighted when he asked her to sing the title role in LA TRAVIATA with the NBC Symphony Orchestra in 1946….Under Toscanini, Violetta — which she had already sung many times at the Met — became one of her immortal recorded performances. In Act IV’s ‘Addio del passato’, the snuffing out of life within Violetta is overwhelmingly moving. Albanese’s remains one of the most vivid, spontaneous and nakedly real Violettas on disc. Albanese had specific ideas about the nature of acting for the opera stage, feeling that it was a mistake to pursue absolute naturalism or to replicate acting techniques from the screen. ‘The stage is a world apart’, she once said, ‘and the opera stage something more specialized still…. You have to add poetry, too.’ She believed that Puccini’s roles were superbly crafted, but she always resisted the temptation to chew the scenery too much, underlining that Tosca was ‘a great diva in an era of poetic elegance’, not a common, hot-tempered shrew. Ultimately, she always believed in the innate dignity and aristocracy of Puccini’s heroines. She believed it was important to begin not with the notoriously tricky role of Manon Lescaut but with Mimì or Liù. ‘Butterfly’, she once said, ‘can break the voice’. She regretted never getting to sing Minnie in LA FANCIULLA DEL WEST, but she did sing her first Magda in LA RONDINE in 1960, in Philadelphia. She also expanded her repertoire carefully, adding roles such as Verdi’s Desdemona, Massenet’s Manon and Cilèa’s Adriana Lecouvreur. Explaining her remarkable longevity to OPERA NEWS’s editor Robert Jacobson in 1974, she said, ‘I never pushed on the low notes, except for some dramatic moments. I was taught to do it with accent and not with the voice. It is important to keep the middle voice light, even when dramatic, or you lose the high notes. The drama comes in accenting the words and with diction’. Miss Albanese also collaborated with some of the most eminent male singers of her time, whose names evoke a grand bygone era. Among them were Jan Peerce, with whom she partnered many times at the Met, and Ezio Pinza, a notorious trickster who made one of her swan songs even more difficult than normal: ‘I remember a BOHÈME broadcast when I kept smelling something terrible in the final scene, where I was dying’, Miss Albanese told The New York Times in 1989. ‘I kept singing, but in between I would whisper to everyone, ‘My God, what is that smell?’ And finally at the end, Pinza pulled a herring out from under my pillow’. Felicia Albanese was born in Bari, in southern Italy, on 23 July, 1909. She began singing as a girl, becoming a pupil of Giuseppina Baldassarre-Tedeschi, a noted Butterfly in her day. Miss Albanese made her début unexpectedly in 1934, at the Teatro Lirico in Milan. At a performance of MADAMA BUTTERFLY at which she was understudying the title role, the soprano became ill during Act I. Miss Albanese was hustled onstage for Act II. A great success, she went on to appear at La Scala, Covent Garden and other European houses. "Although Valletti was a student of Tito Schipa (from whom he undoubtedly learnt some of the graces of production and interpretation), he was in some aspects a counterpart to his coach. 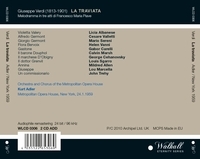 Valletti’s was a light but flexible tenor voice of Italianate lyricism and a rare beauty of tone. His timbre was not as ‘sweet’ as that of Tito Schipa, Ferruccio Tagliavini or Beniamino Gigli, but he was the most accomplished technician of them all."